Rathnakumari is 43 years old, and hails from Kammagundahalli. Her husband Mastamiah works as a helper in transporting iron rods and earns around Rs. 300 per day. They have two lovely daughters and a son. Both their daughters are disabled, and hence cannot even get off the bed without support. They are also subject to frequent fits and require constant care. Under these circumstances, if Mastamiah is unable to go to work for a day, loses pay, and the family needs to go hungry. Post that, life became really difficult for the family. They had just just gotten the surgery done despite the financial struggles, when the rains caused their house to collapse. A kind friend did offer them a place to stay, but having lost most of their belongings, it is difficult for the family to continue the follow-up treatment. HCG foundation helped her a lot to get the surgery and radiation, free of cost. 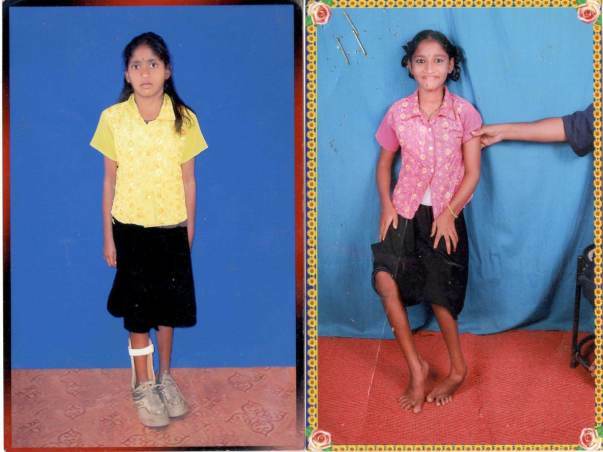 They are unable to afford follow-up care and medication and we are now raising funds to complete the treatment. Right now, it has become really important for her to undergo chemotherapy, as her health conditions are deteriorating by the day. Rathna needs Rs. 50000 per year for Chemotherapy. Right now, the amount is far beyond the family's imagination. Her daughters have no idea of the threat to their mother's life, but cannot survive without her care. Your support can save this mother and her daughters. Thank you for your support. Here is an update on Ratnakumari. She is on regular follow up. 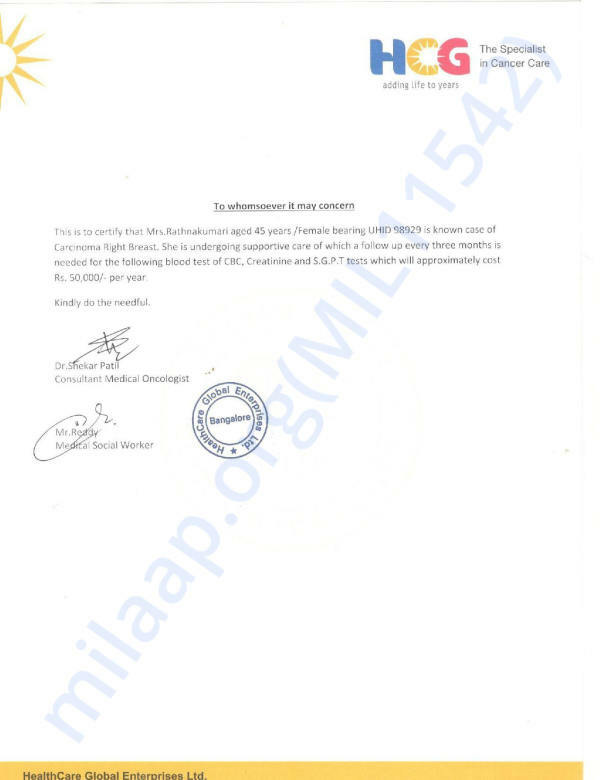 Recurrence happened on July 07th 2018 and is advised to do Biopsy by Dr. Mahesh (surgeon). After the biopsy we will decide what medication is to be done. Here is some news to share. 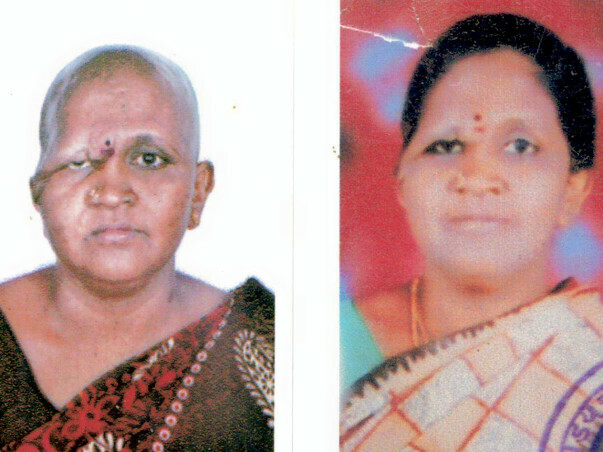 We have spoken to Mastamiah and Ratnakumari’s surgery is almost over. The left side has been operated and the right side had a little complication. The doctor has asked her to get a scan. The report will be due in a week, after which the treatment will continue. Meanwhile it has not been easy for Mastamaih’s family. Last month Mastamaih’s mother passed away and it shattered the world around him. His mum would take care of his disabled daughters. Now, there is no one to do that. The whole family needs to be taken care by him alone. 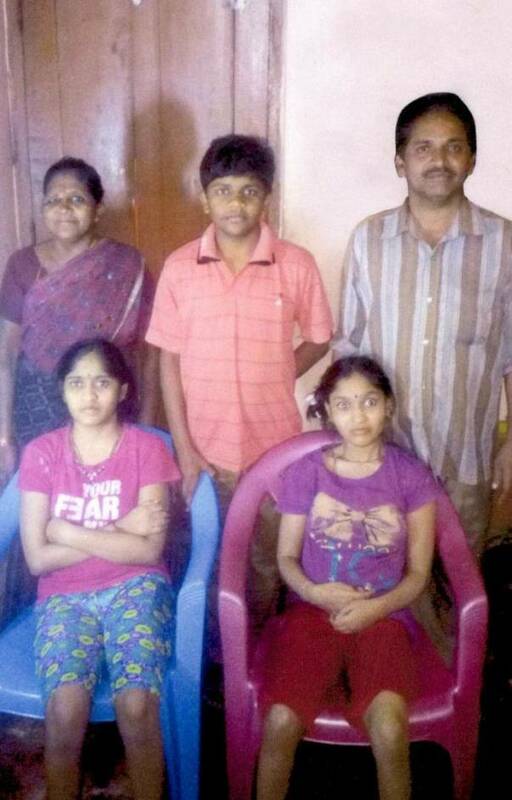 From his bed-ridden daughters’ personal hygiene, getting house hold items to Ratnakumari’s treatment, everything is taken care by Mastamaih. He also goes to work every day and cannot afford to miss even a day as it puts the whole household in jeopardy. The medical expenses for his daughters cost around Rs 300/- for 5 days. Let pray for his family and hope he gets through these tough times.